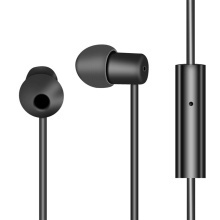 The in-ear sleep earphones is specially designed for listening to music when sleeping. Made of soft silicone material, soft and comfortable to wear. In-ear design blocks ambient noise to help you focus on listening pleasure and to help sleep. Its 6mm dynamic drive unit provides clear high pitch and thick bass, creating extraordinary sound quality. With 3.5mm plug, it is suitable for smart phone, Tablet PC, Laptop, MP3 and other 3.5mm audio devices. Ultra-soft Earbuds: Silicone ear shell, soft and comfortable to wear, perfect for side sleepers, cause no ear ache. 6mm Drive Unit: 6mm dynamic drive unit provides clear high pitch and thick bass, creating extraordinary sound quality. Noise Isolation: In-ear design earphone blocks ambient noise to help you focus on listening pleasure and to help sleep. Hands-free with Mic: Built-in Microphone enables hands-free calls. With in-line control, easy to control music and call. Strong Compatibility: 3.5mm plug headphones is suitable for smart phone, Tablet PC, Laptop, MP3 and other 3.5mm audio devices.